The first on-board trial run! 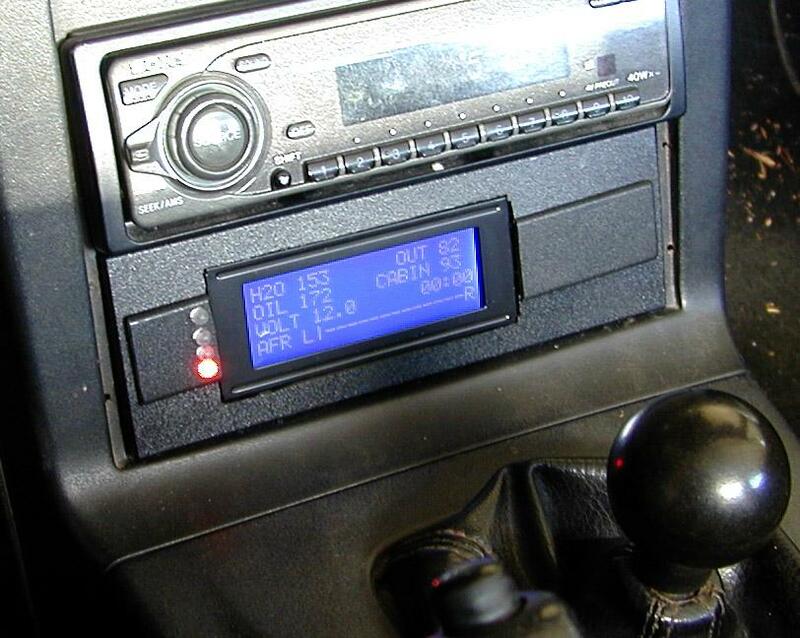 The DIY digital multi-gauge is intended as a single DIN space display of vital engine info... or anything you want. If you want to customize it you will be able to via simple BASIC programming. The microcontroller that controls this is so easy to program that they teach grade school kids how to use these in Europe. Potential additions to the display include compass, clock/calendar, humidity, fuel pressure, wide-band O2, intercooler efficiency, fuel injector duty cycle, RPM, cornering G-force... it's only limited by your imagination, electronics/programming skills and resourcefulness. And wallet. Update 3/18/2008: I haven't touched one of these in almost two years now and I'm not really interested in developing them any further. If you have any questions feel free to email me but I never made any schematics and don't have the time to make one. Google the topics I've written below and you'll have a good start! Warning lights will illuminate when the following pre-set limits are exceeded. Customize the values as you see fit. PICAxe 40 brain. I buy mine (and other PICAxe related stuff) from Peter Anderson. Folks in the UK can buy them almost anywhere. I haven't talked to Peter in a while and I don't know if he still sells so ask him first! 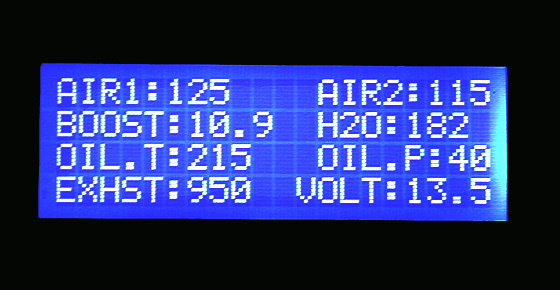 Any standard serial LCD character display (cheapest I could find was 411 Technology Systems). 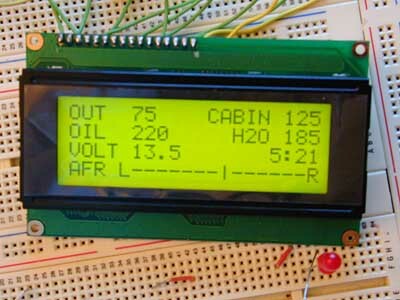 See notes below on interfacing with parallel LCDs. PICAxe to LCD interfacing, the easy way . Note that I used the LCD108 that he no longer sells. If you use my pinouts this might be different! 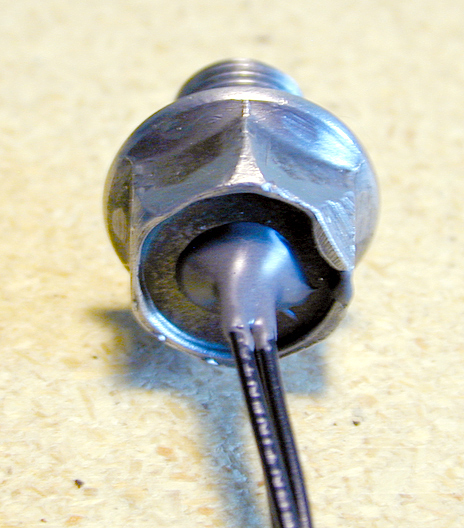 I drilled a hole in my oil drain plug and epoxied the temperature sensor in the hole using JB Weld. Two years later and no leaks! The last time I looked www.turbofreak.com had some good info on air pressure sensors for you boosted folks. The air to fuel ratio section is temperamental because you are measuring a very small voltage difference. The more stable you can make the signal and the power supply the better luck you'll have with that. I found that the engine bay of a car is HORRIBLY noisy in terms of electrical interference. Follow all the instructions on the LM34 datasheet for long distance readings and noise suppression and check out Peter's suggestions for more ideas on long distance noise suppression. This code works, but could definitely be improved upon. There are great PICAxe forums on the internet, as well as electronics forums for hobbyists. Good luck and let me know if you have any questions or if you have any success. I'm always excited to hear about other people's projects that I have helped inspire!